Most of us hand over dollar bills every day without ever really looking at them very closely. They are too familiar. But if you pause to look closely at the one dollar bill, you will see, right below the one-eyed pyramid, the Latin phrase “Novus Ordo Seclorum”. A few readers might find that a slightly esoteric digression into Roman and monetary history, of little relevance to the markets today. In fact, they would be wrong. We started with that overlooked phrase because, over the second half of 2014, the professional investment community has come to believe that the US Dollar has indeed established a “new order” and the trend is now here for “the ages”. Just take a look at the figures. 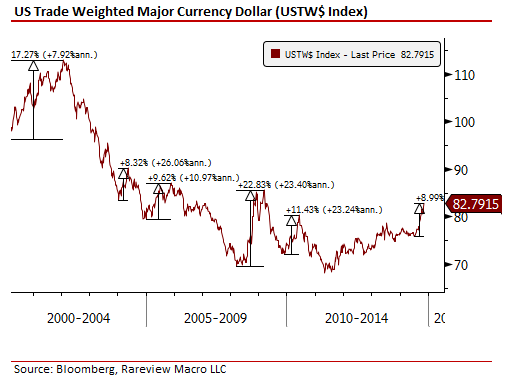 The US Trade Weighted Major Currency Dollar, an index of global currencies managed by the Federal Reserve, has appreciated by 9% since the start of the third quarter. For anyone who thinks that is the kind of volatility the markets see all the time, bear in mind that during the 21st century so far there have been only five comparable episodes where the US Dollar appreciated by a similar or larger magnitude: 2000, 2004, 2005, 2008, and 2010. Many of those were, of course, false starts. The dollar rallied a bit, and then it faded away again. But this time around many serious investors, as well as professional forecasters, think the rally can be sustained. Why? There are two reasons. The first is that the United States is now unique within the global economy in two important ways. It has already been through and survived the Global Financial Crisis, and it now has the only major central bank that has finished with Quantitative Easing. The second is that because all the structural factors holding it back – such as housing, employment, lending conditions, consumer balance sheets, and so on – are getting steadily worked off over time, so that when a cyclical bounce does finally materialize it is going to be a lot more durable than in other regions of the world. The result? While the outlook for global growth deteriorates, the consensus is that the US will be the “best house in a bad neighborhood”. Now, if you add in the end of the expansion of the Federal Reserve‘s balance sheet, it is easy to see why investors have become convinced that both policy and growth are going to continue to diverge between the US and the rest of the world – and in a way that is over-whelmingly favorable to the US Dollar. 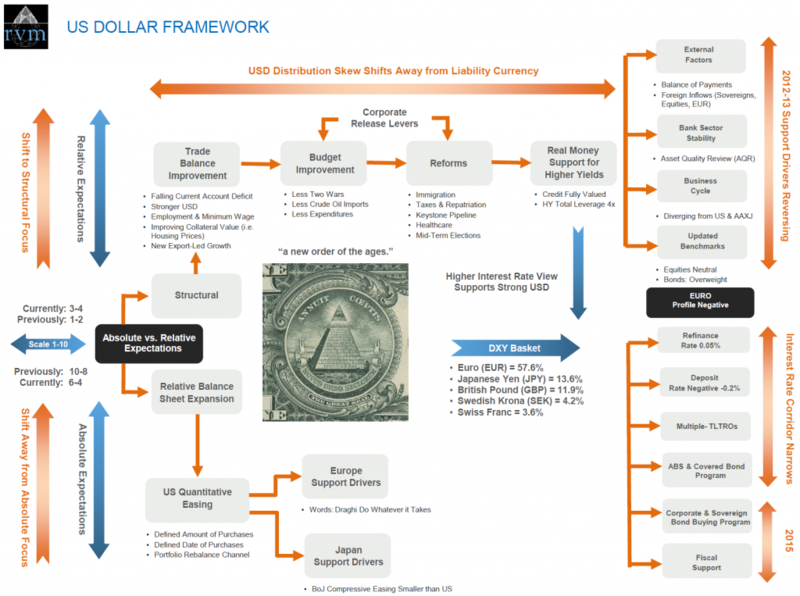 Taken together, this suggests to us that a structural shift in global positioning is now underway – that is, the US Dollar is no longer a “short-term liability currency” and is instead turning into an “intermediate term asset currency”. So far, so good. But how can investors tell whether this is actually what is happening? And, just as importantly, how can they tell whether the trend will remain in place long enough to allow more investors to get on board with this trend and generate some positive performance for their portfolios? In our view, there are many ways to analyze currencies – valuation, interest rate differentials, purchasing power parity (PPP), monetary and fiscal policy, and so on. In order to help all types of investor visualize why we believe that a US Dollar structural shift is underway, we have created the non-standard framework set out below. Specifically, we analyze the foreign exchange market in terms of “Absolute” or “Relative” expectations. If you follow the arrows it should be apparent that the “distribution skew” has shifted to the US Dollar being viewed as an asset and away from a liability currency. We score “Absolute” or “Relative” expectations using a scale of 1 to 10, with 10 being the highest and 1 being the lowest conviction rating. Simplistically speaking, the “Absolute” expectation in the second half of 2014 has shifted to 6-4 – the middle of the range. This is down from 10-8, an absolute range that has largely held static since the introduction of Quantitative Easing in the US and the onset of the euro-zone crisis and Abenomics. The expectation going forward is that the shift away from this “absolute” focus will be incremental as both Europe and Japan continues to struggle to grow and their central banks ease policy to try and boost their flagging economies. On the other hand, the “Relative” expectation has shifted to 3-4. This is up from 1-2, a relative range that has largely held static since the start of the second Gulf War and the deterioration in the US Trade Deficit that followed. The expectation going forward is that the shift to this “relative” focus will be incremental as the (i) United States moves closer to becoming energy independent, (ii) the recovery in housing increases closer to a speed comparable to past cycles, (iii) some level of Government reforms are enacted, and (iv) as the credit cycle reaches full valuation. Collectively, the gap between the two US conflicting views – Absolute and Relative – will continue to narrow. As a result, the “distribution skew” will shift to the US Dollar becoming an asset and away from it being a liability currency. The key point here is that the US Dollar will no longer be a funding leg for a global currency carry trade and the Euro and Japanese Yen will take its place. Secondly, see the right-side of the framework. On the top-right, the drivers that supported the recovery in the Euro exchange rate in 2012-13 – foreign direct inflows, banking stability, an improvement in the business cycle, and investors being fully allocated to the region – are reversing at an accelerating pace in the second half of 2014. This is expected to continue well into 2015 as interest rates are negative and unconventional monetary policy measures – such as balance sheet expansion via corporate and sovereign bond buying – become a larger part of the European Central Bank’s (ECB) tool kit to fight off the deflationary forces gathering across the continent. This profile is likely to last all the way until 2020. While not illustrated in this framework, the same conclusions could be drawn from Japan as a result of its Comprehensive Easing (CE) program. In fact, only recently the Bank of Japan (BoJ) embarked on an even larger unconventional initiative than the US and Europe and the market expectation is that the CE program will now last well into 2017 and perhaps even beyond. The proxy most non-professionals look at is the DXY Index. While the Euro (EUR) and Yen (JPY) maintain a ~70% weighting in that basket of developed market currencies, a similar analysis can be applied to the others – that is, the British Pound (GBP), Swedish Krona (SEK) and Swiss Franc (CHF). Each of these currencies faces its own problems right now, and market expectations are growing that Switzerland is next to face a crunch point. Specifically, in order to remain competitive the Swiss National Bank (SNB) may have to move its deposit rates even lower than the ECB’s (i.e. beyond -0.20%). The takeaway? There will be an even larger divergence been Swiss and US policy – and that is just another of several examples of trends that are strongly supportive for the US Dollar in the medium-term. In conclusion, the market is starting to focus on the “relative” drivers, which have the potential to surprise on upside because of the structural themes we have explained, and which are starting from a low base. And it is moving away from “absolute” drivers that have been in place for many years. While that trend may not develop in a completely straight line, the speed and degree of US Dollar strength could take much of the professional investor community by surprise for months, and possibly years, to come. If that is indeed the case, the founders of the US, and the designers of its currency, will have been proved correct when they designed a currency note with a phrase that was expected to stand the test of time – “a new order of the ages”. Who knows, even Virgil might have been a buyer. Neil Azous is the Founder and Managing Member of Rareview Macro, an advisory firm to some of the world’s most influential investors and the publisher of the daily newsletter Sight Beyond Sight. Neil has close on two decades of experience across the financial markets, and is recognized as a thought leader in global macro investing. 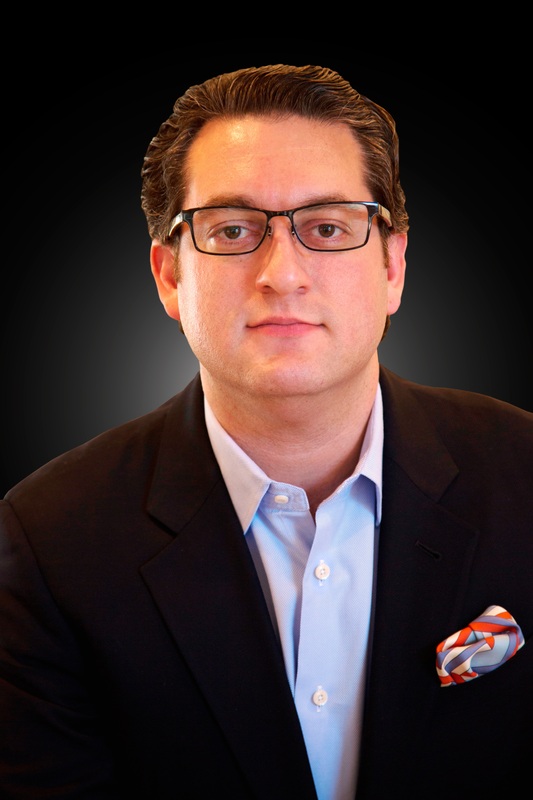 Prior to founding Rareview Macro, Neil was a Managing Director at Navigate Advisors where he specialized in constructing portfolios and advising on risk. On Wall Street, his career included roles at UBS Investment Bank and Donaldson Lufkin & Jenrette, where his responsibilities comprised of trading derivatives, hedging solutions, asset allocation and fundamental securities analysis. He began his career at Goldman Sachs in Fixed Income.